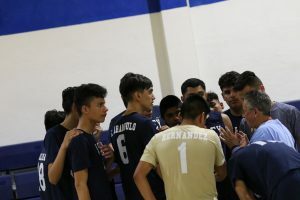 The Boys Varsity Volleyball team defeated Eisenhower in the first round of the CIF-SS playoffs in five sets. The offense was led by senior setters Jose Sanchez and Kevin Gil who spread the wealth and kept our opponents off balance. The Falcon attack amassed 60 kills led by Eli Arambulo with 22 and Brian Juarez with 10. Defensively the team tallied 46 digs with Jonathan Hernandez leading the way with 11. Tomorrow the boys will travel to Burbank to take on Providence in the second round.